Review: Anthony Hopkins plays the character of Stevens. Stevens is a butler to a prosperous British household of the 1930’s. Having stayed loyal to them all the years he comes to then realize how misguided he has been. This has got to be one of the best British films ever made. Well directed and a excellent cast. One of Hugh Grant’s first films that he was in. He only has about a five minute role in it though. This film is over two hours long. Hugh Grant once stated that this is his best film that he has ever done. 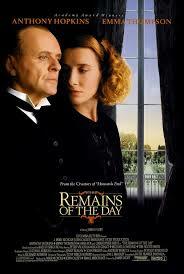 The film is based on a novel by Kazuo Ishiguro. This film is listed in Barry Norman’s top 50 Greatest British Films that was published in the Radio Times. One film critic wrote ‘A touching tale laced with unforgettable performances’.